Every year, Santa arrives in Downtown Bend during the Community Tree Lighting in Drake Park. He counts down to the lighting of the tree (live on KTVZ) and spends all evening seeing kids and taking photos (for free!). The next day he floats through Downtown in the Bend Christmas Parade. After the parade, he is available to see and take photos with kids of all ages. 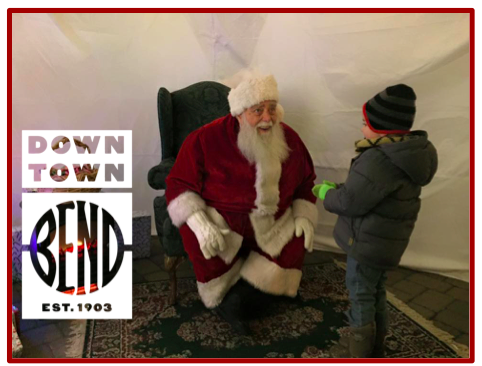 Every Saturday after the parade (every Saturday in December until Christmas) Santa is Downtown from noon until 4pm. Seeing Santa is completely FREE & you can take as many photos as you'd like. Santa does, however, welcome donations to his favorite charity Cove copy. Cove/Copy is a program to send at-risk children, especially those whose parents are/or have been incarcerated, to summer camp near the Wallowa Mountains.